When you are creating a report, sometimes you might want to restrict whom can view results from different attribute values. 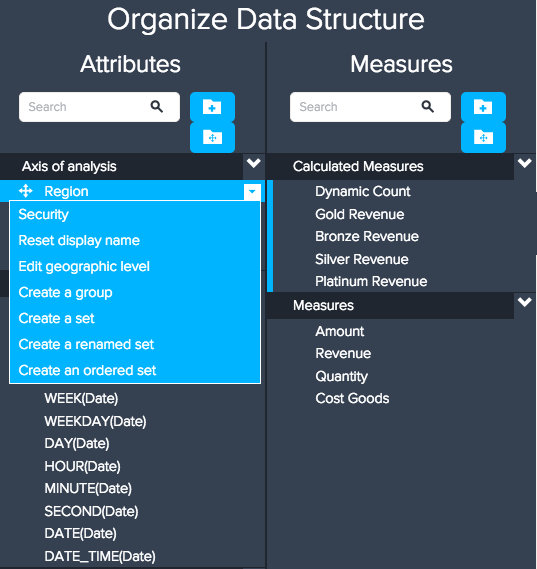 In the Data structure menu, you can edit attribute permissions, so users view only results of selected values. An attribute with security settings in place is referred to as a secured attribute. A secured attribute can be a useful tool for preventing inconsistency and redundancy. For example, if you need to report results on a global basis and on a regional basis to two sales teams, you could create different dashboards for each report. If the charts they need to view are the same, it would mean several different versions of essentially the same dashboard. Instead, you can create a secured attribute to restrict results. To create a secured attribute, you will need to have already created viewer groups (see Creating and managing viewers and viewer groups). In the Query Builder, click the Data structure icon ( ). Click the down arrow next to the name of the attribute you would like to restrict access. The image below restricts access around Region. Select the Security option from the drop-down list. Check the Is this attribute secured? box. 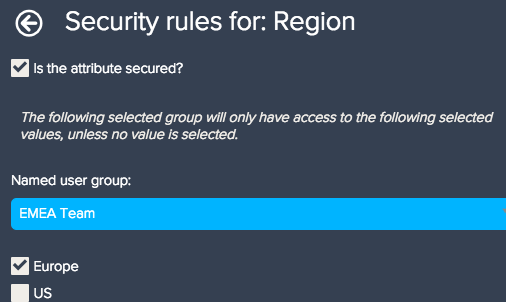 In the Security rules menu, select your viewer group. Select the values the group is permitted to see. The example above permits each regional group to view only their region. Click Apply to secure your attribute. Note: Selecting viewer groups here only grants them rights to access data from this query. You will still need to grant access to dashboards. Click the down arrow next to the secured attribute, then select Security. Select a different viewer group or restricted values. Uncheck Is the attribute secured? to remove all attribute permissions.